There are two organizations that keep track of “world record” fish; the International Game Fish Association (IGFA), http://www.igfa.org/ and the Fresh Water Fishing Hall of Fame (“the Hall”), http://www.freshwater-fishing.org/ . IGFA specializes in listing records for marine fish and fish from all over the world while the Hall specializes in records for North American freshwater fish. Here in my office we receive the annual edition of the Hall’s world records and they also send out quarterly updates. I found an interesting article in their most recent quarterly update and I want to share that with you here. 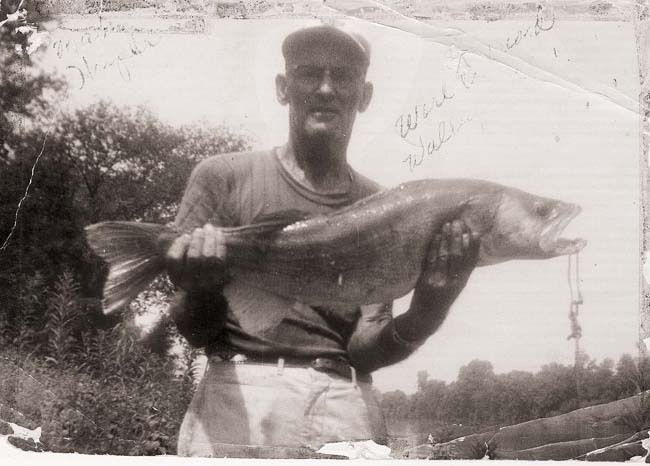 For years the Hall had recognized a 25-pound walleye caught from Old Hickory Lake in Tennessee as the all-tackle world’s record. That fish was caught by Marby Harper in 1960. As you can imagine, historic record fish were not quite the same as if those fish were caught today; record catches were not documented in the same way 50 years ago as they would be today. In many cases those catches were valid, but since they were not documented as rigorously as they would have been if caught today, they are considered as good stories, but somewhat questionable as records. I also believe folks have little appreciation for history; if something did not happen during their life time, then somehow it does not count, never happened, is just some story you read in a book (even the books themselves are becoming part of history). There was one picture of the Marby Harper walleye and there were folks that cast doubts on the true size of that fish based on that one photograph. The controversy surrounded the claim that Marby’s walleye was 41 inches long. Doubters claimed that based on the size Marby’s hands in the photograph compared to the length of the fish, there was no way that fish could have measured 41 inches. In 1996, based on those arguments and claims, the Hall removed Marby Harper’s fish as the all-tackle world’s record walleye. This past spring the Hall reinstated the Marby Harper walleye as the all-tackle world’s record. Why the reversal? New documentation! The Hall had found, or someone had produced additional photographs of the head of the walleye (after the fish was cleaned! 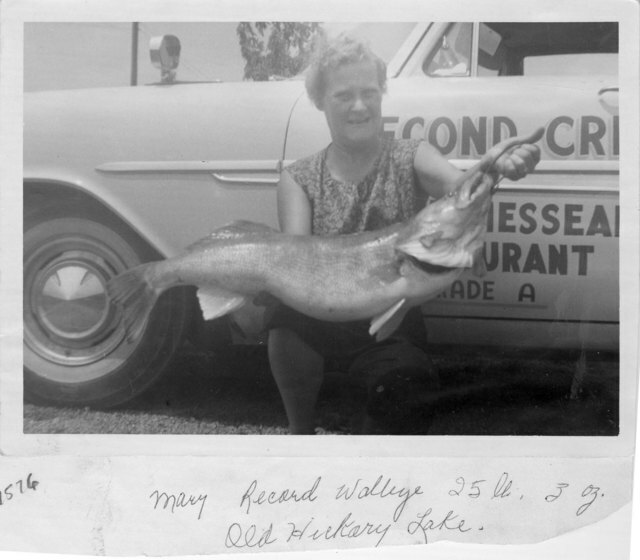 ), and a picture of Marby’s wife, Mary, holding the walleye. Based on that and additional evidence including affidavits from a conservation officer involved in the official weighing and measuring of the fish, the Hall concluded that Marby’s fish was indeed 41 inches long and weighed 25 pounds!!!!! So, if you want to know what world’s record walleye looks like, if you want to know what a 41-inch walleye looks like, in addition to the previous photo, here is the photograph of Mary Harper holding the fish. WHAT A WALLEYE! That record has “stood” for 50 years now. There have been walleyes close to 20 pounds caught in recent years, are even a few others in excess of 20 pounds that have been documented, but nothing close to 25 pounds. And you know what? Somehow I think it is appropriate that record is pictured in a black & white photo. Somehow it adds to the mystique, the history, the legend. Will it ever be broken? Who knows? But you know what? I am fine if it never is broken; in many ways walleye fishing today is as good or better than it ever was, but an old “black & white record” gives us something to shoot for! This is not my story, I have shared just part of it. I would highly recommend that you go here and read it for yourself, http://www.freshwater-fishing.org/articles-tips/DHarper/Dettloff-Harper-Walleye.php . What a fantastic article,Thanks for sharing Daryl.